The hop is pretty familiar term even to every day average Joe Sixpack. We hear about hops constantly from Miller’s triple hop brewed marketing campaign to the Sam Adams commercials in which Jim Koch is rubbing and smelling hops in the palm of his hand. What many people don’t know is what hops are or why they are used. Hops didn’t always play a role in the history of our favorite beverage, in fact when you look at the whole life of beer the introduction of hops didn’t happen until very late in the drinks history. Today I have heard arguments that hops are so overused it almost seems like to some that it is a lazy brewing technique. 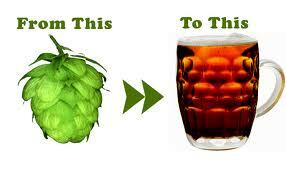 We are getting ahead of ourselves let’s talk about the history of hops.